Kape said: "It's a great shop -- always great fun to go shop or just browse around there. Lots of English books (also German, French and I think some in Spanish and Italian... maybe some other languages too. Russian?)." The Academic Bookstore has two outlets in Helsinki - downtown and in Itäkeskus - and one each in Espoo (Tapiola), Vantaa (Jumbo), Tampere, Turku and Oulu. 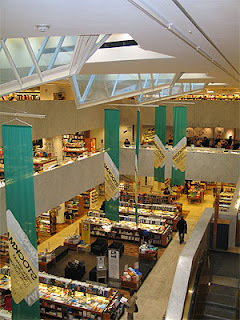 The flagship bookstore in the Helsinki center was designed by Alvar Aalto and it is the biggest bookstore in Nordic countries. The size of the store's stock - around 450 000 books - speaks for itself. And in contrast to its huge size, it's also known for its warm and book-browsing friendly atmosphere and its knowledgeable and multilingual staff which is ready to help. The bookstore has a very wide foreign language section, and a considerable part of it is made up of books in English. One whole section is devoted to books on Finland, it's history, culture or nature and if you're interested in Finnish language, you can also find many Finnish for foreigners publications. Newspapers and magazines from all over the world can also be found in this huge store. Besides the products on offer in the store, it's also possible to make online orders. The Academic Bookstore (Akateeminen Kirjakauppa) in the center of Helsinki is one of the works of the famous Finnish architect Alvar Aalto (the bookstore was built in the 1960s), who is often credited as the "father of modernism" in Scandinavia. Although the bookstore may seem quite ordinary from the outside, with its rather business-like facade. 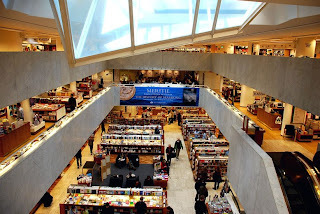 However, the interior is a whole different story, with the white marble and glass skylights which illuminate all three floors of the bookstore. Another nice feature of this bookstore is the Café Aalto, placed on one of the balconies on the second floor, which even has its own bakery.